After completing his bachelor’s in business management from London in 2001, Mahmood Abubaker Shaikhani, then in his mid-20s, was expecting to run the show at his father’s rubber insulation factory in Ajman, UAE. Returning to the UAE, decked up in his brand new two-piece suit he came to the factory hoping to take charge, but was in for a shock of his life. His father asked him to go home, change his attire, wear a comfortable pant and t-shirt, and report back at the factory in 30 minutes. Perplexed, he returned when his father took him by his hand inside the factory, where he was ordered to work as a workman. “I used to get a salary of Dh2,000 a month and had to follow the rules and regulations set for all workers. If I was late to work my salary would be deducted. There were no exceptions and the accountant was advised so by my father,” he tells Emirates 24|7, who is now the Group Director of Shaikhani Group, headquartered in Dubai. The Group comprises 35 companies, employing 400 people and has an annual turnover of Dh257 million ($70 million). After spending 18 months in the factory, grasping the finesse of running a business, finally the day dawned when Mahmood’s father who himself had come to the UAE in 1996 from Karachi, Pakistan, told him he could now run the factory. “I started emphasising on expansion as our sales started increasing. At one point of time we controlled 90 per cent of the rubber insulation market in the Middle East,” he asserts. 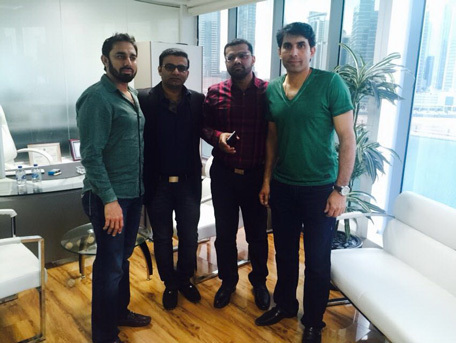 Mahmood and his brothers with Pakistani cricketer Saeed Ajmal and team captain Misbah-ul-Haq. Seeking to expand the factory size, Mahmood purchased a 145,000 square feet plot of land in Ajman in 2004. “We purchased the land for Dh7 million. We were working on moving our factory to the new plot and had almost completed our plans when we got an offer of Dh12 million for the land. After due deliberations, we decided to go ahead and sell the land,” he says. Soon afterwards, the upcoming businessman purchased another plot, close to the existing factory, moving to the new premises in eight days - without stopping production even for a day. The extra money from the land deal was used to buy plots in Ajman with Mahmood deciding to acquire his first piece of real estate – a building in International City, Dubai in 2005 - for Dh6 million. Next, he bought a plot in Jumeirah Village for Dh7 million, but realised he had overtraded and was running short of money. “I was not able to comprehend how I could pay for the Jumeirah Village land. As I was driving to Ajman, the broker called me insisting I deliver him the cheques immediately or else the deal would be cancelled. In 2005, Mahmood launched his first real estate project - Champions Tower in Dubai Sports City – following which he acquired more land in the Sports City, International City and Jumeirah Village Circle. The toughest part of the business came during the global financial crisis in 2008. “We were late in meeting our construction milestones on our projects. We decided to meet our customers’ demands and so we liquidated our land parcel in Pakistan, pumping in over Dh30 million across our portfolio of projects, which led to confidence amongst our customers,” he asserts. 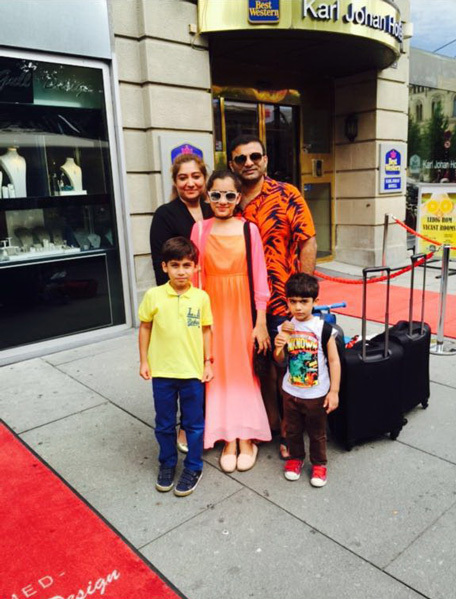 Mahmood with his wife and children. Handover commenced for the Frankfurt Sports Tower in Dubai Sports City in May 2016, with the company planning to deliver two more projects by December. “We will be handing over the remaining towers in 2017,” he reveals. Confident of Dubai’s real estate market, Mahmood plans to launch new projects, utilising his land bank in Jumeirah Village and Arjan. The company's under development projects are worth Dh1.5 billion with another Dh2 billion planned to be invested by 2025. Despite knowing that one day he would run his family business, Mahmood, while studying in London, worked as door-to-door salesman to make ends meet. “My father used to send me 400 UK pounds, but it was not sufficient to meet my needs. So I used to work as a door-to-door salesman, making between 2,000 and 2,500 pounds a month,” he discloses. 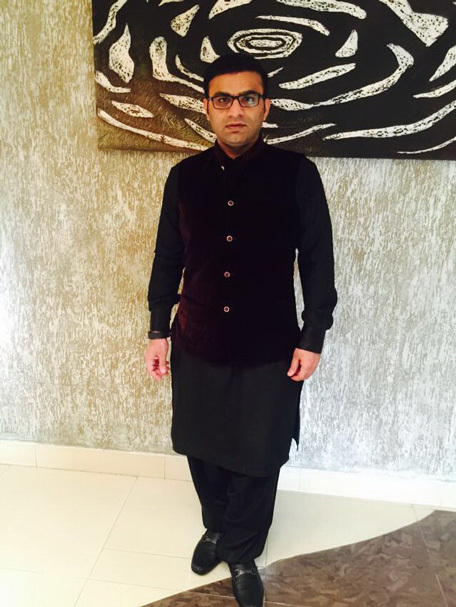 He now runs a call centre in Pakistan, which offers sales and customer services to clients of the same UK company where he once was a salesman. The 38-year-old businessman advices young entrepreneurs not to take “aggressive” decisions. “I used to be an aggressive decision taker but my father told me not to take decisions in a jiffy. Though sometimes one needs to take ‘immediate’ decisions, however, one needs to analyse the future impact before taking the call,” he mentions. He is all praise for the vision of the UAE leaders, who have transformed the country to an international hub for businesses. “Where in the world have you seen so much development taking place in a decade? The UAE is a safe haven for investors, offers great quality life for people along with safety and security, which no other country offers. We have witnessed and will continue to witness number of people from around the world come and settle here in the country,” he concludes.